I took the afternoon off this afternoon as i was a bit worn out hunching over a bunch of sites, code, and monitors today. 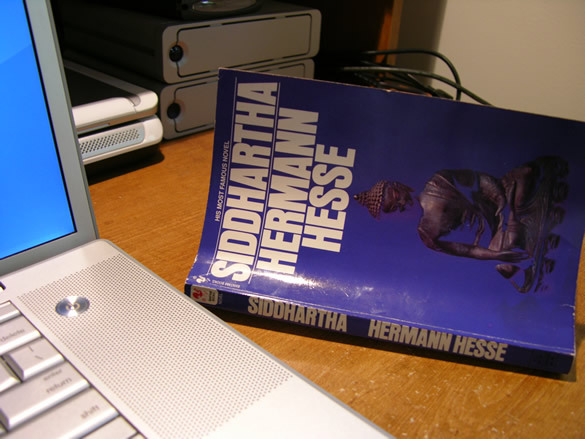 I put a chair outside to enjoy the sun and get rid of some of my programmer’s tan… and I managed to read Hermann Hesse’ novel – Siddhartha in one sitting. (150 pages) I give it a 9/10.. and while i’m no literary expert I certainly and immediately identified with Siddhartha, the main character and I would recommend that you seriously consider it for your reading repertoire. Or here is the whole thing via the Gutenburg Project if you felt like printing it or reading it in the glow of lcd ..